Join us for a free, public presentation in word & song celebrating five years of the Bowery’s listing on the National Register of Historic Places. 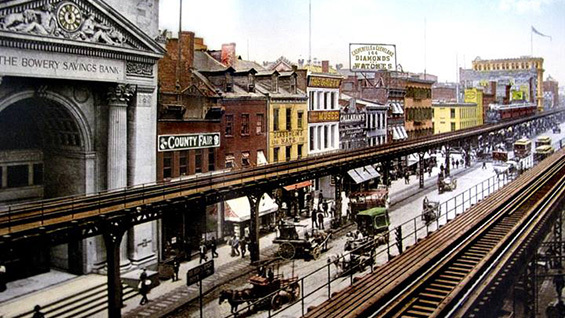 Native American footpath, Dutch farm road and site of NYC’s first free Black settlement, the Bowery stretches 1.25 miles from Chatham Square to Cooper Square. It was an early hub for the working class, gangs, gays, and immigrants. It has seminal links to dance, theater, baseball, streetcars, tattooing, Irving Berlin, Abe Lincoln, and Harry Houdini. In the 20th century, it helped launch Beat literature, Abstract Expressionism, and punk rock. It is one of NYC’s most architecturally diverse streets, and now one of America’s most endangered. Presentations include a talk by David Mulkins, vintage songs sung by Poor Baby Bree, and a conversation between architectural conservator Michael Devonshire and architectural historian Kerri Culhane.